Last month I was invited to make a presentation for the parents at a local preschool. Unlike most of my presentations, this was a hands-on workshop. We used alphabet stamps , pencil crayons , alphabet stickers and alphabet foam shapes to make reading games. This sort of workshop becomes very social – the adults get to play with the craft supplies for a change! Over the years, I have made many, many pre-reading and reading games. Apart from the fact that the games can be customized with respect to theme and difficulty, from a cost perspective, homemade can’t be beaten! I’ve also tried to ensure that many of the games allow children to be active and move while they play and learn. For one of the games, I used green mesh placemats . I cut out lily pads (beige works for elephant footprints) and then painted letters onto each lily pad / footprint. The clingy nature of the placemat material ensures that the lily pads are not slippery when placed in ABC order on the floor. The children love to hop from one lily pad or one elephant footprint to the next, singing the ABC song. Gift wrap is another great source for learning games. I’ve made games to used with many, many themes – everything from birthday cupcakes to balloons, pond life, western, sports, truck theme and the circus. From time to time, you can find a licensed gift wrap that matches something you are doing in the classroom. I’ve used Cat in the Hat gift wrap . My favourite resource for pre-reading craft activities is Kathy Ross. 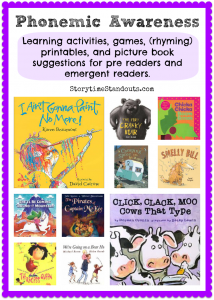 For learners who are a bit older and in need of assistance with reading, Peggy Kaye has great ideas. 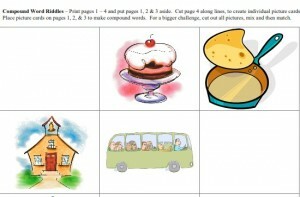 Don’t forget to check out our free, printable reading games. 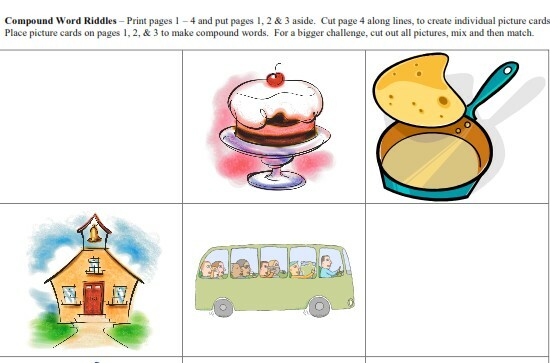 Our printable early literacy resources for making reading games are in PDF format, if you don’t already have Adobe Reader, you will need to download it to access the reading game download. Another way to help children develop phonemic awareness. Matching the ending consonant sound is more difficult than matching the beginning consonant sound. Use a die and markers, move along the "star" path from one star to another. When you land on a star, say the letter name or say the letter sound or say a word that starts with the letter. Pictures to match with words. Free printable animal-theme alphabet for preschool and kindergarten. Cut the pictures apart and have children match the initial consonant sound - a great way to support the development of phonemic awareness. You won’t regret using wordplay to support your child’s phonemic awareness – good phonemic awareness will help a young child with reading readiness and spelling. At one of my Parent Education programs at a preschool last Fall, I talked about the importance of helping children to develop phonemic awareness. I explained that, together with alphabet recognition, good phonemic awareness is critically important for young learners. We want children to understand that words are made up of sounds and we’d like them to learn to play with the sounds in words. Developing a good understanding of rhyming is one element of this. Children who ‘get’ the concept of rhyming are gaining phonemic awareness. After my presentation, one of the moms in the audience told me that she’s been playing, “How’s Your Nose, Rose?” with her young son. The game begins with one of them asking, “How’s Your Nose, Rose?” The other replies with, “How’s Your Back, Jack?” and the game continues until every possible body part rhyme has been exploited; “How’s your toe, Joe?”, “”How’s your arm, Parm?”, “How’s your leg, Peg?”, “How’s your brain, Jane?” etc. 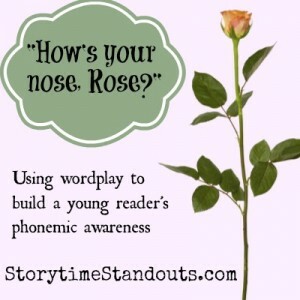 What great fun and what a marvelous learning opportunity; it doesn’t cost a penny, it can be done anywhere, and asking, “How’s your nose, Rose?” just might make waiting in a long line a tiny bit easier. If you have a great idea for an inexpensive, portable reading lesson, I hope you’ll share it with us. So, how’s your tummy, Mommy? For more information, visit our page about phonemic awareness.